The New Jersey-based company’s OG2 satellite was a prototype for a new 17-member communications satellite network scheduled to be launched aboard two more Falcon 9 rockets in 2013 and 2014. Orbcomm declared the satellite a total loss and filed a claim under an insurance policy worth up to $10 million, "which would largely offset the expected cost of the OG2 prototype and associated launch services and launch insurance," the company said in a statement. Orbcomm had planned on reaching an altitude of 466 miles above Earth, but fell well short of the mark after one of the Falcon rocket’s nine Merlin engines shut down early following launch on October 7 from Cape Canaveral Air Force Station in Florida. With its remaining eight engines making up the lost power, the rocket successfully completed its primary mission, sending a Dragon cargo capsule to the International Space Station. The flight was the first of 12 for NASA under a $1.6 billion contract. 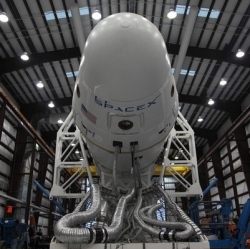 To ensure the station’s safety, the agreement with NASA prohibited Space Exploration Technologies, or SpaceX as the privately-held California-based company is known, from restarting the rocket’s second stage – needed to deliver Orbcomm’s satellite to its proper orbit – if there was not at least a 99 percent chance that the rocket had enough fuel to complete the burn, said SpaceX spokeswoman Katherine Nelson. Due to the engine shutdown, the Falcon 9 used slightly more fuel and oxygen to reach Dragon’s intended 202 mile- (325-km) high orbit. Over the next 2.5 days, Dragon flew itself to the station’s orbit 250 miles above Earth. It reached the $100 billion outpost, a project of 15 countries, on Wednesday. Falcon 9 had enough kerosene fuel left over to relight the engine, but the amount of liquid oxygen "was only enough to achieve a roughly 95 percent likelihood of completing the second burn, so Falcon 9 did not attempt a restart," Nelson wrote in an email to Reuters.